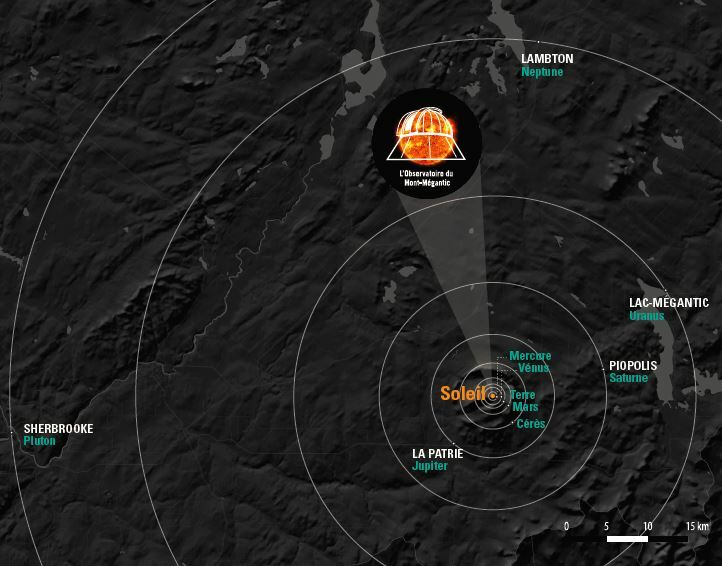 Welcome to the Solar System of Mont Megantic International Dark Sky Reserve. Designed to scale by size and distance, spread out along Summit Drive, this is one of the largest representations of this type in the world! Measuring hundreds of millions of km, our Solar System is so wide that it is difficult to imagine it well. What would be its proportions if we could reduce the Sun to the size of the Observatoire du Mont-Mégantic (1.4 million km to 14 m)? Compressed 100 million times, our planetary neighbourhood would spread out across the whole region! While exploring the Dark Sky Reserve and the Summit Drive, you can discover 8 planets and 2 dwarf planets. Five of these celestial bodies are on the Parc national du Mont-Mégantic territory, in Notre-Dame-des-Bois, and the other five are distributed among the municipalities of the region: La Patrie, Piopolis, Lac-Mégantic, Lambton and Sherbrooke! The closest star? At this scale, would be farther than the Moon! Take a look at the Guide to enjoy the discoveries on your visit ! CLD du Haut-Saint-François, Ville de Sherbrooke, Observatoire du Mont-Mégantic and Summit Drive.